Chilliwack, BC –Tuesday may have brought the rain, but it didn’t dampen the spirits of Terry Fox’s Dad Rollie, his wife Janet, Chilliwack Mayor Sharon Gaetz, Chilliwack Hope MP Mark Strahl and Terry Fox Run Coordinator Desmond Devnich. The annual flag raising ceremony prior to the 35th Anniversary of the Terry Fox run was done outside of Chilliwack City Hall. The Chilliwack Corn Maze will also pay tribute this weekend to Terry’s efforts to find a cure for Cancer. The Terry Fox Run in Chilliwack takes place Sunday, September 20, at the Landing Sports Complex. Registration begins at 7:30am, with the Run’s opening ceremonies at 8:45am and the Run start at 9:00am. From tragic circumstances, it was a dream as big as our country. Terry Fox was diagnosed with osteogenic sarcoma in his right leg in 1977 and had his leg amputated 15 cm above the knee. While in hospital, Terry was so overcome by the suffering of other cancer patients that he decided to run across Canada to raise money for cancer research. He called his journey the Marathon of Hope. Terry’s Marathon of Hope took place in 1980 with the simple objective of informing Canadians of the importance of finding a cure for cancer. With fierce determination, he ran an average of 42 kilometres every day for 143 days. Terry was forced to end his run on September 1, 1980 when the cancer spread to his lungs. By February 1, 1981, Terry’s dream of raising $1 for every Canadian was realized – the Terry Fox Marathon of Hope fund totaled $24.17 million. Terry died in June 1981. “Thirty-five years later, the Terry Fox Run continues to inspire countless young Canadians,” says Chilliwack Run committee chair Desmond Devnich. “In 2014, the Run in Chilliwack saw 207 participants raise over $18,127 for cancer research through the Terry Fox Foundation, and we hope to exceed that this year,” Devnich says. You can register online for Chilliwack at www.terryfox.ca/terryfoxrun/chilliwack Abbotsford is here. Movember – So What Is This Again? .. Mustaches and Fighting Cancer? 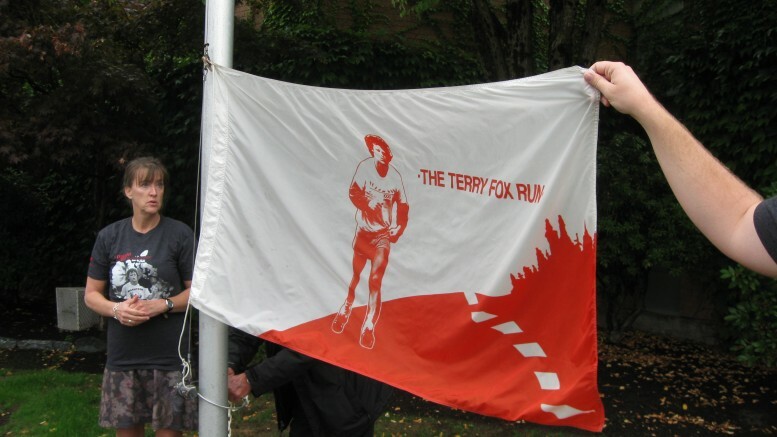 Be the first to comment on "Terry Fox Run 2015 – Flag Raising"